Mineral Deposits are scattered across the planet’s surface. A player can take control of them to gain additional resources. Each of four main Raw materials may be available there to take. A player must assemble a fleet with at least one Transport ship and at least 1 land unit carried. A fleet without land units cannot seize the Mineral Deposit. After the above fleet reaches its destination, unless it loses a battle with an enemy fleet stationing there, the player seizes control over the Mineral Deposit. 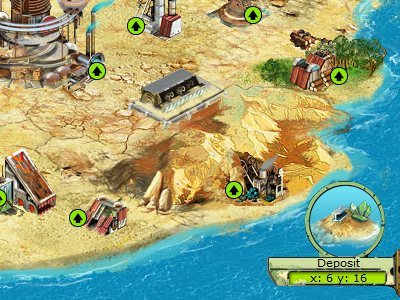 Its miniature appears on the main island screen in the lower right corner (a player receives a message, confirming the seizing of a Mineral Deposit). If there is an enemy fleet stationing at the Mineral Deposit we want to seize, we must send a strong fleet with the ’Attack’ order and win a battle with the fleets stationing there first. To gain resources from a Mineral Deposit a player must assembly a fleet with a Rafinery ship and send it on an ’Exploit’ mission to the Mineral Deposit. A fleet with a Refinery begins to exploit a Mineral Field after reaching it, this process may take a while. A fleet with a Refinery returns to its home island, all gathered minerals are returned to its Warehouse and become available for use. The amount of raw minerals acquired depends on other ships that accompany the Refinery. Each Transport increases the capacity of the fleet, but also increases the time needed to fill it full. The fleet with a Refinery returns only after reaching full capacity. After returning gathered minerals, the Refinery fleet automatically goes back to the Mineral Deposit to gather more (this task is performed continuously). a player may return a refinery fleet at any time. One island may control no more than one Mineral Deposit.